The Best Mortgage Information comes from? With mortgages, there is no “one-size fits all”. Mortgages (and the rates) vary according to your personal situation: income, debts, down payment, credit score and so many more items. Your best source for mortgage information is a local, experienced, mortgage broker. If you don’t know one, contact me for an introduction to my preferred lender. This shows we have a lot of smart people in this country. Almost one third relied on a mortgage lender. Slightly fewer named their Realtor. 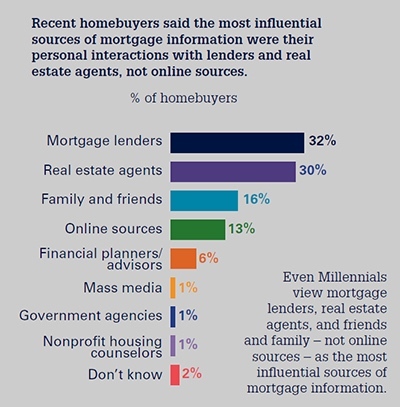 Before I get too flattered with that, a Realtor is not the best source of mortgage information. If you ask me about mortgages I’ll tell you exactly that and introduce you to my preferred lender, who is a mortgage broker. Next most often used, family and friends, may be a good source if they’ve recently financed a home purchase (but the best mortgage for you is almost certainly not the same as the mortgage your family or friend got). The best source remains a mortgage broker. The reason is that mortgages are so varied and complex (and changing) today that you have to be in the business every day to have good, up to date, knowledge of what’s available that best matches for a particular borrower. A mortgage broker has access to dozens of mortgage sources and probably works with 8-10 on a daily basis. They are the best place to find the best mortgage for you. $200/month More to Buy Same House in Portland Next Year? In proverbial "round numbers", mortgage payments on the average home in Portland next year will be about $200/month more than today if this forecast increase in mortgage rates is correct. (To check the forecasting accuracy of these sources, I looked up their January 2012 forecast for January 2013 – they were within 0.2 of today's average rates. That's to buy at the same price. 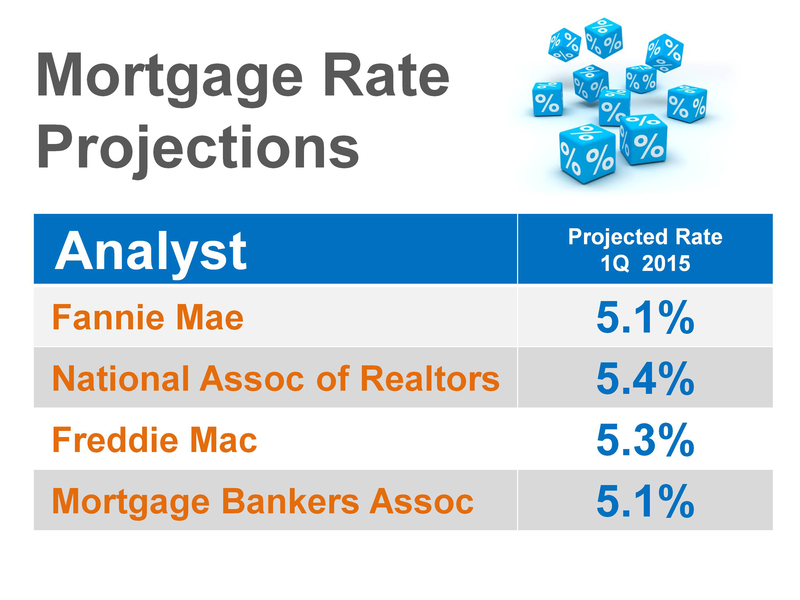 If home prices go up 5-6% as predicted, it's even more. Should You Buy or Rent a Home? 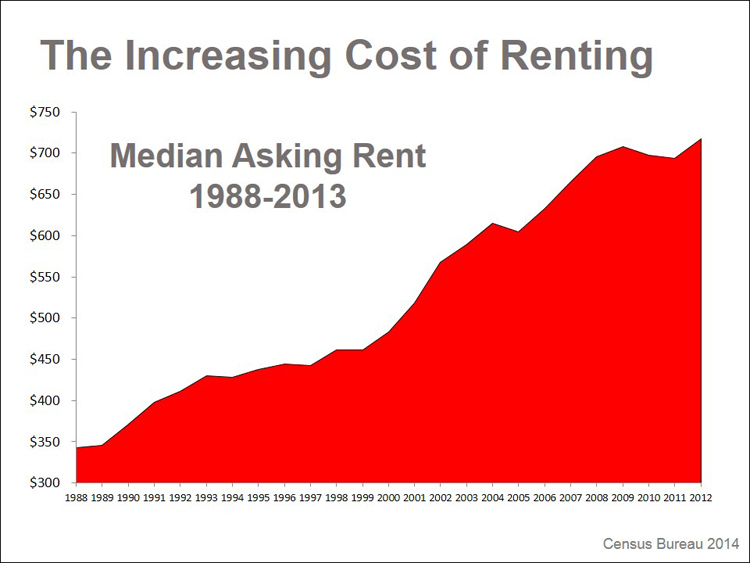 Or Invest in Rental Homes? This chart is the simplest answer to both questions. The longer you rent, the higher the cost, and while you have paid for a place to live, you have nothing to show for it but rent receipts. On the other side, buying a property to rent has all the advantages the renting does not. In either case, a fixed rate mortgage would hold your costs level (OK taxes might go up, but that's a minor part of the equation), while your rental income increases. And in both cases, there are significant tax advantages. For Home Owners, mortgage interest is tax deductible. For Investors, you also get depreciation and other deductions. Don't believe me? I can recommend a good Portland CPA. When Searching for Homes, all Real Estate Web Sites are the Same, Right? Wrong! If you want to see ALL the homes that meet your search criteria, you're much better off searching on www.DaveSuttonHomes.com (which uses the Windermere search engine) than either Zillow or Trulia, and probably any of the other real estate "syndicator" sites that accumulate listings from a wide variety of sources. In Portland, only 80% of the homes for sale appeared on Trulia, 81% on Zillow. So using one of those sites to search for a home missed one of every five homes listed. The Windermere site had 100%. Why the difference? The study showed that the median time between a home being listed and appearing on Zillow was seven days! Nine for Trulia! On www.DaveSuttonHomes.com it's 15 MINUTES or less! In Portland, median days on market for the most desirable homes is now not much more than 12. Recently I've held two homes open in NE Portland. For each I prepared a list of homes sold in the last 90 days within a quarter mile of that home. In both cases the median days on market for the over 30 homes on the list was 13! Half of those 30 homes sold in 13 days or less! So a lot of the homes are sold before they ever appear on Trulia or Zillow. That's just one more good reason why you're better off to list your home for sale with Windermere, too. The reverse is true, too. Over one in three homes shown for sale on Zillow (36%) or Trulia (37%) at NOT actually for sale. Windermere is not perfect here. 1.7% of homes on my web site were not for sale either. The whole research report is available here. It's actually pretty readable as research reports go. We all look at the INSIDE of a home when we think about what affects value, and that's rightly so. 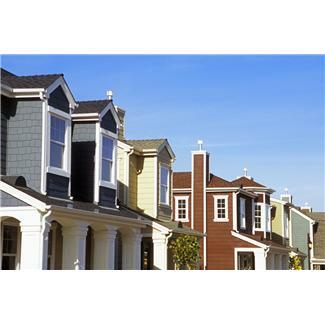 But it's easy to overlook the important neighborhood factors that also have a significant impact on a home's value. *Walk Score is a 0-100 rating based on how close a home is to shopping, restaurants, library, coffee shop and the like. It's something probably half of the Portland buyers I work with rate as one of their top three most important factors. It's at http://www.walkscore.com/ or there is a link on my home page. Another agent in my office recently listed a Portland house which the seller (Let's call her Mary) had purchased without a home inspection (or Realtor representation). The buyer (Let's call him John) did buy a home inspection, which discovered mold, faulty wiring and hazardous attic insulation, among other things, all of which will cost Mary $12,000 to remediate. That $12,000 is an expense that most likely could have been paid by the seller when Mary bought the house. So in this case Mary saved $400 (a typical home inspection fee) and is now spending $12,000 to complete the sale to John. 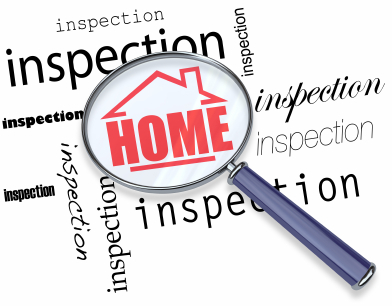 Even beyond that, I recommend to all my clients, buyers and sellers both, that they purchase a home inspection. The advantage for a seller is that any significant issues are found and can be addressed by either fixing the problem, offering a credit, or adjusting the list price. The advantage to a buyer is that significant issues discovered will usually be corrected at the seller's expense. My recocommendation to all clients, whether buyer or seller, is to not have the seller do the repairs. It's much better to either credit the amount of necessary repairs to the buyer at closing, or adjust the sale price by that amount. That way a seller doesn't have to deal with the repairs or any unhappiness from the buyer about the quality of work; a buyer gets to select who and how the work is done without worrying that the seller did the work "on the cheap".